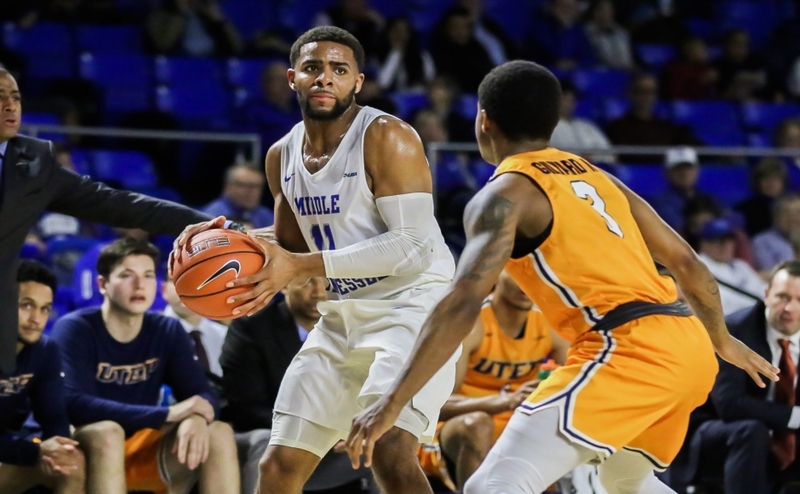 After dropping their last two games against Rice and North Texas on the road, the Middle Tennessee State Blue Raiders (6-16, 3-6) shocked the C-USA world by dethroning the first place UAB Blazers (14-8, 6-3) by a score of 71-65 Wednesday at Murphy Center. UAB jumped out to an early seven-point lead when sophomore guard Zack Bryant connected on a jumper from the free throw line to extend the Blazer advantage to 15-8 after the first 10 minutes of action. The Blue Raiders stormed back and embarked on a 12-0 run in the next three minutes to take a 20-15 lead after a Jayce Johnson three-pointer. MTSU led by as much as nine in the first half after a Donovan Sims three-point bucket from the right corner gave the home team a 26-17 lead. In what was a game of runs, UAB bounced right back and ended the half on a 16-7 run to end the half tied at 33 when center Makhtar Gueye knocked down a running hook shot in the lane with only 16 seconds left until halftime. The second half started with a Johnson layup to give MTSU a lead, but the Blazers stormed right back and took another seven-point lead following a Lewis Sullivan free throw. 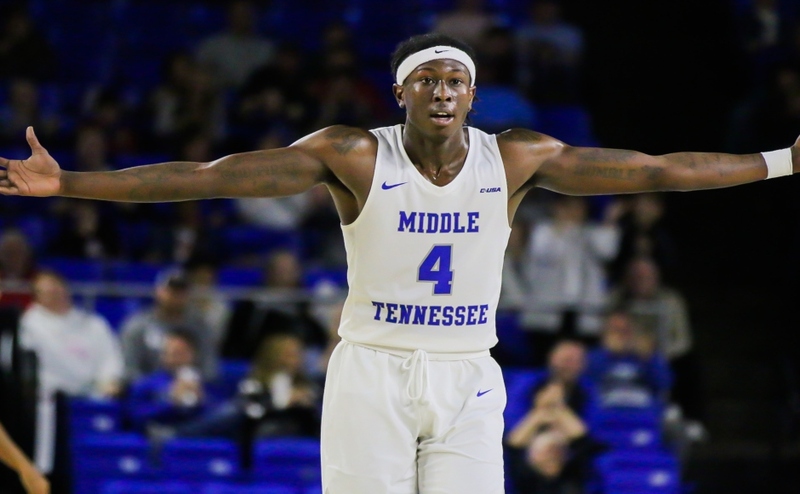 The Blue Raiders led by as many as seven points in the second half when a Reggie Scurry lay-up gave MTSU a 60-53 advantage with 7:34 remaining in the game. UAB inched within two points after Bryant split the Blue Raider defense and zipped a pass to Sullivan on the left block, which lead to an easy lay-up with 2:24 left to make the score 65-63. With MTSU still holding on to that two-point lead in the final minute, Sims took control of the game. 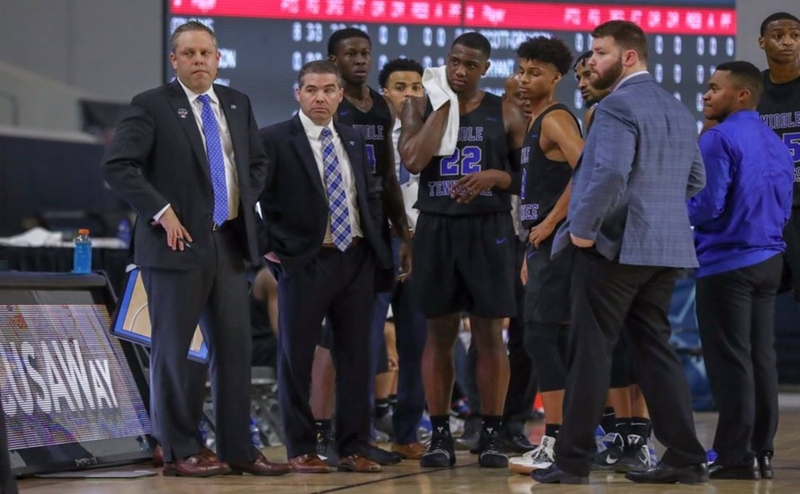 With the shot clock winding down, Sims took one dribble inside the perimeter, dribbled between his legs, stepped back behind the three-point line and drained a three-pointer as the shot clock expired to give the Blue Raiders a 68-63 advantage with only 38 seconds remaining. 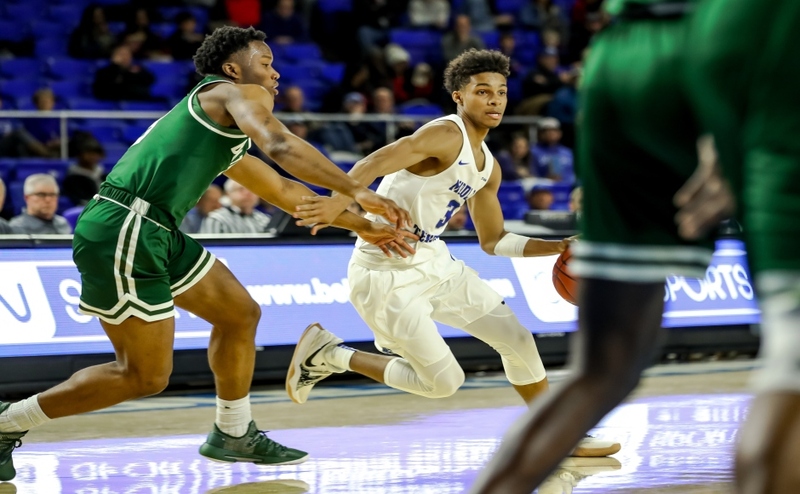 UAB missed multiple three-point attempts and was never able to recover from the Sims dagger three-pointer, and the Blue Raiders went on to win by a score of 71-65. The Blazers were led by Bryant who finished with 21 points on 8-15 shooting as well as recording five assists and tallying six rebounds. 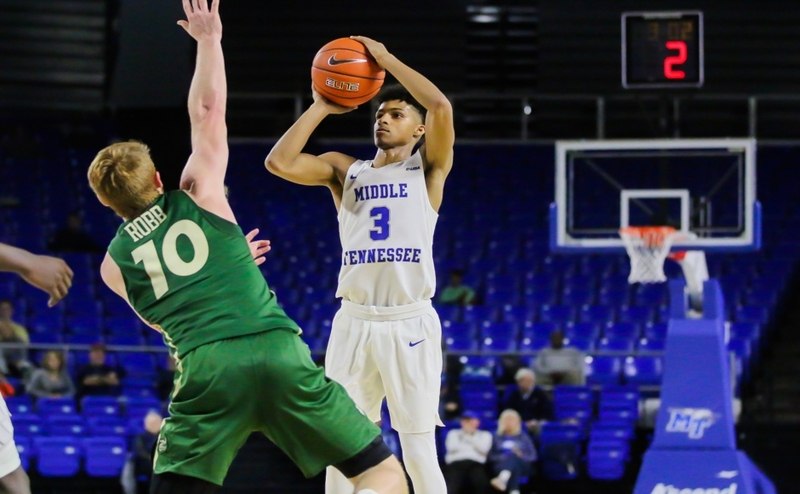 For MTSU, it was a balanced scoring effort as four Blue Raiders scored in double figures. Sims led the Blue Raiders in points, rebounds and assists on the night as he scored 19 points on 6-10 shooting to go along with nine rebounds and four assists. Antonio Green finished with 17 points, Scurry scored 14 and Johnson rounded out the double-digit scoring with 11. MTSU will travel to Birmingham on Saturday to square off against the same UAB team at 7 p.m.